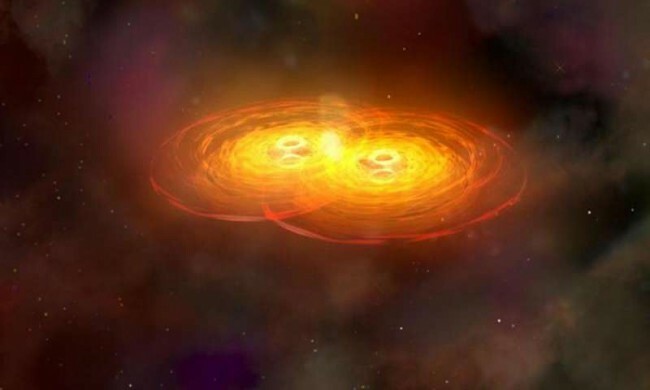 An artist’s concept of two colliding black holes, in the process of merging. Credit: NASA / CXC / A. Hobart. (Phys.org)—PKS 1302-102 is one of the few known quasars with a pair of black holes within its accretion disc. It is also a curious case for astronomers as it will produce a powerful explosion when these two black holes merge. The scientists trying to determine the scale of this merger estimate that it could result in an enormous release of energy. “The result will be an enormous release of energy, roughly equivalent to millions of supernovae, in the form of gravitational waves,” Matthew Graham of the California Institute of Technology (Caltech), one of the co-discoverers of PKS 1302-102, told Phys.org. The quasar is in its final phase of the merging process. It could help us predict what the final stages of a black hole merger look like or how long the process might take. This is the so-called “final parsec problem”, yet unsolved, as all theoretical models failed to explain the process. Graham and his colleagues at Caltech, using the Catalina Real-Time Transient Survey, detected a strong, smooth periodic signal when observing PKS 1302-102 in optical and infrared light. Periodic signal was something that scientists haven’t seen before in a quasar, so they suggest that it means the presence of a pair of supermassive black holes. “In January 2015, we reported the detection of a five-year periodic signal in twenty years of optical data from PG1302-102 in Nature. We offered a number of possible physical mechanisms but they all required a supermassive black hole binary as the basic hypothesis,” Graham explained. “It is a periodic variation, not a flickering, which is random. It happens on all wavelengths that we can probe, not just in infrared. It was discovered in the visible light first,” George Djorgovski of Caltech, also one of the co-discoverers of the quasar, told Phys.org.